How to Jump Into Social Media — As a leader in traditional handwritten communication you might be surprised to read that Wall Street Greetings is, if you will, jumping canon-ball style into social media and online digital advertising. We noticed that in the B2B greeting card space there is not much social media activity. However, our industry neighbors in the stationery and gift retail categories successfully use social media to expand their brand recognition and have created a fanatic following for boutique greeting cards. Paper Source a leader in the stationery and gift industry based out of Chicago, boasts 188K Instagram followers, 30K Twitter followers, and over 4K YouTube subscribers. 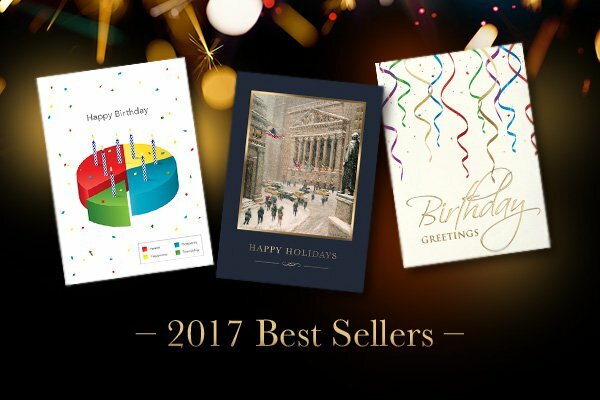 Wall Street Greetings aims to be different than other corporate greeting card companies. We consider ourselves a partner, not a supplier. Therefore, we are dedicated to offering the very best greeting cards for business. All of our cards are designed in-house by a distinguished collection of award-winning greeting card artists. We partner with new and celebrated artists to feature eye-catching photography, watercolor, oil, pastels and graphic designs. Our graphics team spends hours perfecting the layouts, color choices, font types and themes of each design we send to press. “Design is one of the few disciplines that is a science as well as an art. Effective, meaningful design requires intellectual, rational rigor,” says Debbie Millman in her book, How to Think Like a Great Graphic Designer. Our team understands the complicated task of creating compelling artwork for business, keeping in mind compliance regulations, brand appeal and the client relationship. This dedication offers our buyers a curated collection of greeting cards that specifically fit the needs of business professionals. We believe our customers are going to enjoy seeing more of our products and design influences online. When you start following Wall Street Greetings on Twitter, Facebook, LinkedIn and Instagram you will receive a daily dose of professional content and design inspiration. Attach numbers to your client groups. What percentage are new clients, what percentage has left, and what percentage are loyal returning clients? On average, what is the length of time you work with a client? Create a paragraph bio of your target audience so you can identify what needs you can meet through your social media communications. It is all too common for businesses to set marketing strategy based on what everyone else in their space is offering. However, the more effective measure is what does your business offer that is distinct from the competitors? Articulating the top five key-phrases or words that represent your brand will shape the voice of your social media campaign. Find articles and key influencers online that you can reference and your followers would appreciate connecting with their content. Think about how to build on relationships and shared information. Make sure they are informative and align with your voice. Take photos and prepare images ahead of time. Create unique design templates that can be used for each content category, such as layouts specific to featuring quotes, people, products, or promotional content. Having one person manage the accounts keeps things organized. Most likely, you are not concentrating on just one platform. The task of organizing scheduling and creating content is best assigned to one person that can delegate the support work needed for each social media campaign. This also ensures that the voice of your brand stays consistent. Once you have a content bank you have to organize how frequently and in what order to schedule posts. It might be helpful to reference a calendar of national holidays and find dates that coincide with your business messages. You can also set campaigns in place and target goals on how many posts, followers, messages you plan to release during each campaign. Use Microsoft Excel to create a monthly schedule that you can duplicate and reuse annually. You can schedule your posts ahead of time on each individual social network, or use a tool like Hootsuite to schedule all of your social media posts in one place. Hootsuite offers a free option for up to three platforms. This prevents you from having to log in and post content each day. The time it takes to post is most likely the reason your good intentioned social media efforts get neglected. An automated scheduling tool will help you combat this repetitive decline. As we’ve worked through the exercise of developing our social media strategy our team has found a renewed sense of dedication to what makes our company, and our products, unique. Articulating the messages, images and personality of a business is important work. Our dedicated, loyal customer group have reason for committing to our company and its products. Making our team stop to consider what makes these loyal buyers continue making purchase decisions with our business has helped us set a strategy for sharing this message to new prospective customers. It is an exciting task, initiated by a commitment to digital advertising and social media to build brand alliance. This entry was posted in Uncategorized, Wall Street Greetings, Business and tagged Wall Street Greetings, business on May 16, 2018 by wallst_greet. 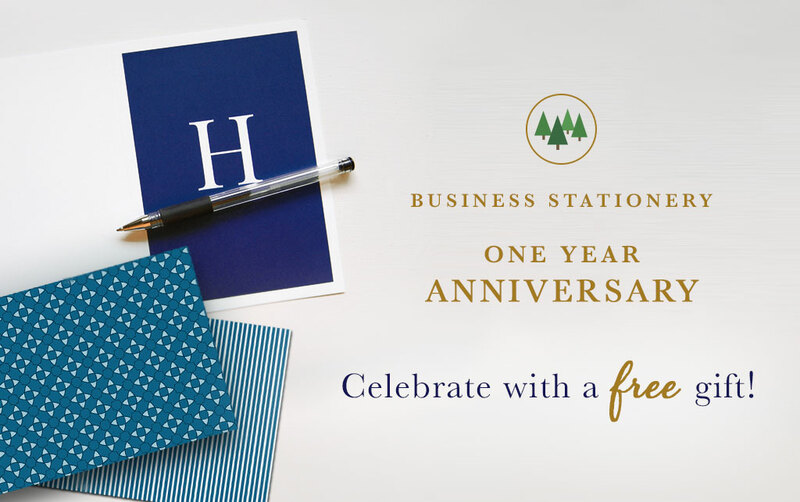 We are celebrating the year anniversary of our Business Stationery line. Released on Earth Day in 2017, this collection of stationery was conceptualized after hearing the needs of our customers. We heard the need for everyday written correspondence in business; used for occasions such as follow-up after prospect meetings, sending client reminders and employee recognition. 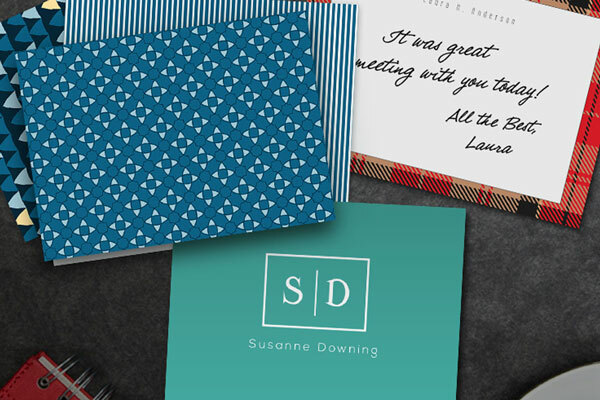 With the same dedication to design and quality that we give to all our card lines, we set out to create premium stationery sets that work for your business needs, as well as offering you the opportunity to do good with your purchases. A percentage of proceeds from every stationery set sold goes towards the National Forest Foundation in planting trees in restoration projects nationwide. Your purposeful spending enabled us to double our annual giving in 2017 from previous years. In honor of this milestone we’re giving away a free branded notecard set with discount code NOTECARDS. Instructions for ordering follow. No other purchase is required. Shipping and handling are not included. Here’s to making a difference in big and small ways; protecting our Earth and connecting with others through a simple handwritten note. Search product code "NC16CL" on the website. Click on the product then click the “Personalize” button. In the personalization tool, use the “add image” button to upload your logo file. In your shopping cart enter “NOTECARDS” in the discount code box. *While supplies last. Promotion ends Friday, April 27. This entry was posted in Uncategorized, Wall Street Greetings, Promotions, Note cards, Business and tagged business relationship, Wall Street Greetings, sale, business, Business Stationery on April 23, 2018 by wallst_greet. I’m approaching my 33rd birthday this spring. I remember, soon after graduating college a little over 10 years ago, sitting in a local diner with my mom having a discussion about my future. I was lucky enough to be working in what I had always considered my dream job, the greeting card industry. I was contemplating starting a side hustle, my own line of hand-illustrated stationery and gifts. My mom compassionately advised, “Ten years from now you will still be a very young woman with a lot ahead of you.” We forget the angst of our younger years. So what does my life look like ten years after that discussion? I do not live a fast life with excess wealth. I am either wrestling at home with my two young daughters and husband or at work with my staff and advisors. I do not get enough sleep and I have noticed wrinkles setting in around my face. I do not exercise as much as I’d like and I reach for a chocolate snack much more than necessary. I accept a little nervous twitch of the eye around times like Christmas and birthdays when there do not seem to be enough hours in the day. I try to meet too many expectations I think others have for me, and I forget to make time for reading, creating and just sitting. My house seems to always be unkempt and my desk decorated with paper piles. Drinking coffee is no longer a relaxing method for approaching a new day; I down it like the late night tequila shots of college days and quickly move on to the next cup. However, with all that, I truly believe I’m the happiest I’ve ever been. I have two beautiful healthy daughters, a husband that is a teammate and my favorite person to be around. I have a robust support system of family and friends. My career is creative, exciting and I am constantly learning and improving. Most importantly, I am able to affect others for good in my work. Ten years later I’ve noticed that what I thought would be so important- success, fame, and achievement, really is not the goal. And haven’t we all heard this before; isn’t this something I should already know? It takes living a little to realize we are all living very similarly. When I became a mother I became a better leader at work. I had a new understanding of what matters most to the parents on my team. On a daily basis with my family I am working to motivate a stubborn toddler to put on pants or a curious one-year-old not to touch, similar to how I must understand the fundamental motivators for a work group. When I better understand my team I can better influence and lead. As I enter new phases with my children I feel like I am living the wise parables freely passed around for the last three decades of my life that I previously considered useless sayings. These sayings such as, “long days and short years,” exist and withstand because they are universal. Celebrations of marriage, births, new beginnings and the heartbreak of death and loss are shared experiences and ways we connect. It is hard to separate professional and personal when faced with the most meaningful times of life. 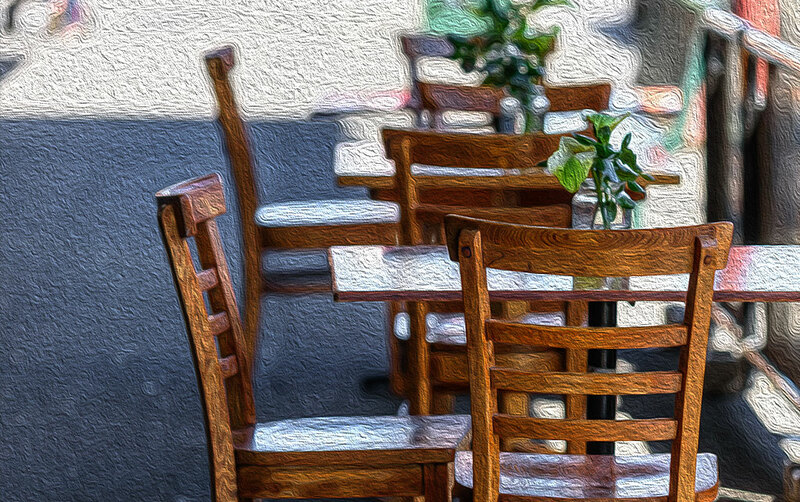 The lines blur and relationships deepen. To me, this is why in an age where digital is king we still take time to send handwritten cards. Companies are made up of people; businesses grow because of people and relationships. Business relationship tools are pivotal to success. It is imperative for businesses to reach out personally, not just professionally. No matter the industry there is a need and time to reach out in celebration or sorrow to demonstrate compassion and give value to our shared human experiences. According to The Advisor Coach, "when you send out these cards, they aren't just paper and ink. They are a symbol that you're someone who cares enough to recognize and honor your relationship with them. It evokes a sense of loyalty - a loyalty that pays dividends several times over." Think back to times in your life when you were surprised and impacted by a genuine gesture of care. Most likely, it wasn’t grand in nature, it was simply that someone unexpectedly invested time in your situation. Greeting cards are one of the most effective business relationship tools because they allow you to appropriately express care, celebration or concern giving you the opportunity to connect. Circling back to summarizing my current phase in life, most likely if you are a parent reading this article, you can identify with the same feelings of abundant joy paired with exhaustion and defeat. If you are not a parent, you most likely can understand the road we all travel in young adulthood chasing what we deem to be success. Perhaps, like me, you’ve found that the simplest things in life, connection with people, are really where we find success. I’ll end with a call to action – what prospect or client have you failed to connect with and how can you reach out on a personal level? Is there something you could mention in a handwritten note, an encouragement, memory or quote that would cause that individual to pause and recognize that you took the time? Ten years after beginning my professional career, I have learned what’s most important - that working towards and maintaining a happy life requires proactively and continually connecting with people. And I love that my work in corporate greeting cards helps others to connect and build relationships that support their success. This entry was posted in Uncategorized, Corporate Greeting Cards, Wall Street Greetings, Business and tagged business relationship, Wall Street Greetings, greeting cards, helpful hints, business on March 14, 2018 by wallst_greet. I can appreciate that my daughter’s preschool is cautious to the immature emotions of a 3 to 5 year-old, and I have utmost respect for the decision not to cause anguish for the kids and staff. However, I have to argue that Valentine’s Day is so much more than a day about monogamous relationships. As a card enthusiast, Valentine’s Day is one of the best holidays of the year. The creativity behind each clever caption and well thought out design is truly delightful to behold. 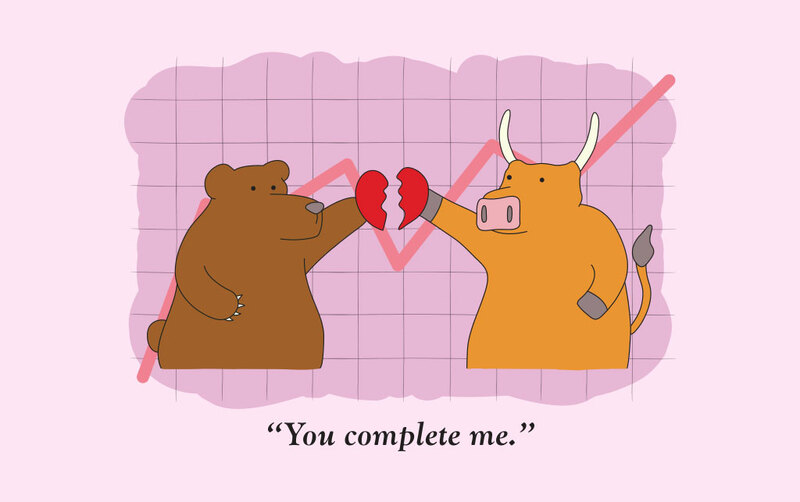 I could spend hours perusing the social media pages of card designers – all filled with cheesy puns and inspired illustrations. I could spend additional hours sketching my own designs and adding paper hearts and googly eyes. I salute any holiday that makes us stop and celebrate relationships, especially when they are regarded with a hand-written note. At the heart (get it) the holiday is not about consumerism and over the top romance. It is simply about reaching out with a simple note of appreciation. As an expert in professional greeting cards used as relationship building tools, I am well versed in the power of using cards to demonstrate feelings of appreciation. The act of sending a follow-up note after a meeting means you prioritized the exchange enough to spend more time drafting and mailing a card. Remembering to send a card in advance of a birthday, anniversary or special occasion indicates you prioritize your clients. In today’s fast paced, electronic world, we all know the extra time that went in to sending a card. The Greeting Card Association estimates 1 billion Valentine’s Day cards are sent each year, making Valentine’s Day the second largest card-sending holiday of the year. Valentine’s Day presents the perfect opportunity to reach out to family, friends and professional relationships with a sincere sentiment of care. Chase Bank understands connecting with consumers on a more personal, involved level. Fall of 2017 they hosted 20 Chase for Business learning sessions featuring key-note speaker, Mel Robbins, inviting women small business owners to gather within their region. The event sparked conversation, passion and growth, a win for Chase Bank. This initiative is an approach we can all learn from as we set strategy to retain and keep clients. This is an unBULLievable place to work, thanks to you. We’re “in to” IT, thanks for all you do. You’ve got the number one spot on our card! It is a tradition the staff has grown to enjoy, or at least play along. So, in summary, a piece of advice this Valentine’s Day; don’t skip the card! For my daughter’s school, I don’t think anyone will mind that we’re baking cookies for the teachers and including a hand made card. This entry was posted in Uncategorized, Wall Street Greetings, Holidays, Business and tagged business relationship, Wall Street Greetings, company culture, business on February 14, 2018 by wallst_greet. 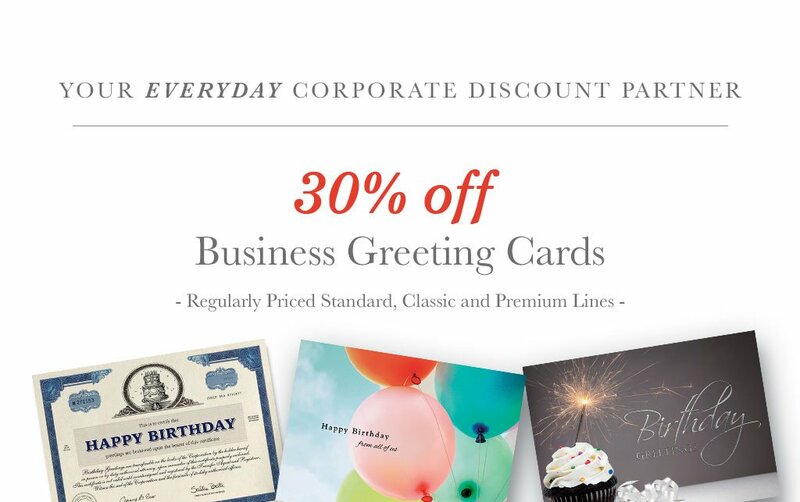 We are pleased to offer a year-round discount of 30% off all Standard, Classic, and Premium cards. As your partner in making meaningful connections with clients we guarantee quality products at reasonable price points. Our various lines of cards range in price from $.70 to $2.50 to ensure your business will find just what you're looking for and capture the attention of your clients. This entry was posted in Corporate Greeting Cards, Corporate Birthday Cards, Business and tagged corporate greeting cards, Wall Street Greetings, greeting cards, customer appreciation, business on February 1, 2018 by wallst_greet. We're glad to thank you for all you did to make 2017 a great year. Birthday Pie Chart, Wintry Wall Street, and Elegant Streamers Birthday. Your orders contributed to $17,000 in charity, supporting national causes such as Hurricane Harvey Relief and the National Forest Foundation. We increased our product offering to include a complete line of business stationery. Our second location opened just in time for the 2017 holiday season; allowing us to process more orders, quicker. Ultimately, placing card orders in your hands faster than ever before. Thank you again for a great year; we're working to make sure 2018 is even better. This entry was posted in Uncategorized, Wall Street Greetings, Business and tagged corporate greeting cards, Wall Street Greetings, greeting cards, birthday cards, customer appreciation, company culture, business, financial greeting cards, Business Stationery on January 25, 2018 by wallst_greet. Team Building: How Are You Reaching Your Employees? How are you building your team? What is your company culture like? Like many businesses, you can probably identify both areas of strength, and some places for improvement. The quick and easy act of giving a handwritten note can go very far. 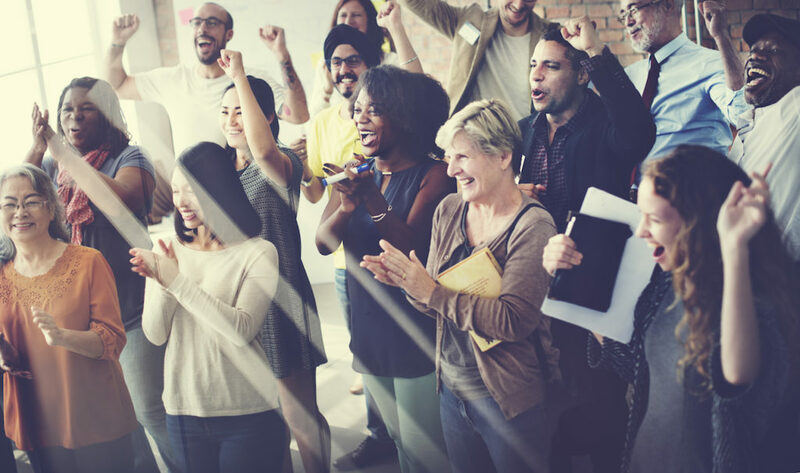 It is a humble and honest way to express your gratitude, to reach out during difficult or exciting times, or to simply let a team member know you see their contributions. Whether you are managing an office or working solo and building a community of business partners, you have a team of individuals that can help or hurt in your success. Make sure you have not overlooked their significance in your routines, your bottom line, and your future success. Try it once or twice and you will learn not to underestimate the impact a handwritten note will make. This entry was posted in Uncategorized, Corporate Greeting Cards, Wall Street Greetings, Note cards, Business and tagged business relationship, Wall Street Greetings, helpful hints, company culture, business, employee satisfaction on September 20, 2016 by wallst_greet.